Export your staff bank details in one easy file for direct import into Attaché. The Attaché Bank Details Export add-on allows you to easily create a Bank Details Export for importing into Attaché. 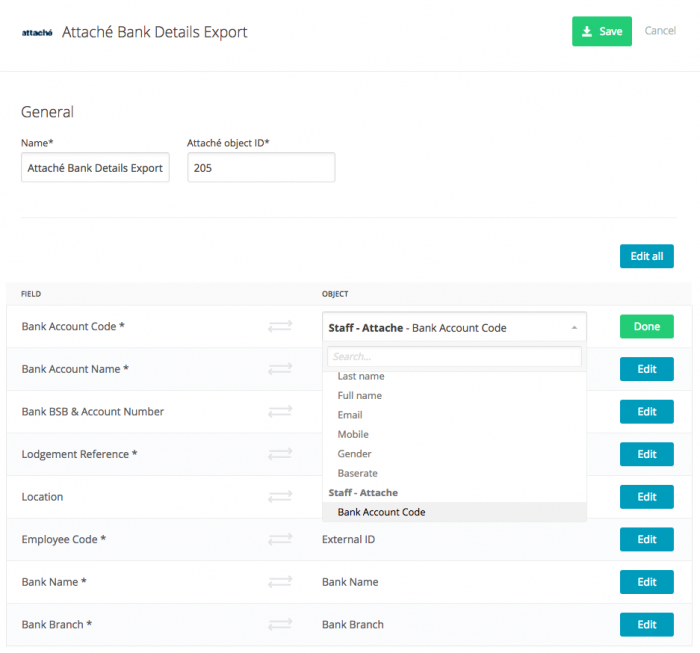 The Attaché integration can be added to your account by navigating to Add-Ons > Attaché Bank Details Export. Attaché object ID*: The Attaché Object ID table (available from the Attaché Members website) lists all the Attaché menu items and corresponding Object ID numbers. Bank Account Code*: A unique identifier created in Attaché for every employee bank account (may be the same code as the Employee Code). Bank Account Name*: The name of the staff bank account, usually the staff first & last name. Bank BSB & Account Number: For Australian bank accounts, enter the BSB and Account Number together with no spaces. Location: Optional field used that may be used for separate entities, such as states, branches or divisions. Employee Code*: Attaché Employee Code. This should be set up during your Ento implementation, so for any future changes or additions, it’s advised to chat to Ento Support for assistance. Click the yellow Export button next to the AttachéBank Details Export. For assistance with your Attaché system, including importing bank details, please contact the Attaché support team or your Attaché account manager.